As the train left Hiroshima behind, still almost two hours before it arrived in Hakata, I got settled in my seat, got my bento box and a can of beer out of my bag. A bento box containing oysters, a Hiroshima specialty. It smelled delicious, tasted even better. This entry was posted in Japan and tagged Bento, food, hiroshima, shinkansen on July 5, 2016 by Traveltorgeir. 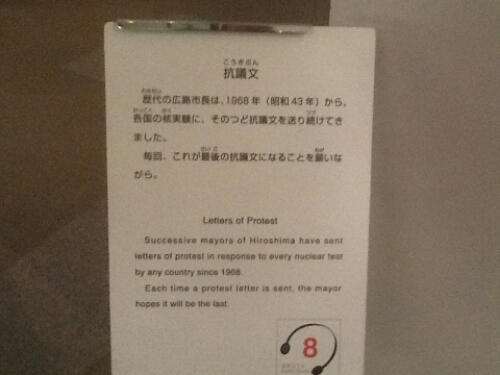 Since 1968, every time a new atomic bomb has been tested, the Mayor of Hiroshima has sent a letter of protest. Every time the hope is that this will be the last atomic test. This entry was posted in Hiroshima Week, Japan and tagged hiroshima, nagasaki on August 6, 2015 by Traveltorgeir. I visited Hiroshima and had okonomiyaki in March 2014. Okonomiyaki, often called Hiroshimayaki when served in Hiroshima, is a culinary speciality from the city. It is also called Japanese pancakes. This entry was posted in Hiroshima Week, Japan and tagged food, hiroshima, okonomiyaki on August 4, 2015 by Traveltorgeir. I visited the Memorial Cathedral for World Peace in Hiroshima in March 2014. In Hiroshima, not far from the park Shukkei-en, lies the Memorial Cathedral for World Peace. This beautiful church, its design based on monasteries in the middle ages, was built thanks to the effort of father Hugo Lasalle. This entry was posted in Hiroshima Week, history, Japan and tagged atomic bomb, cathedral, catholic, hiroshima, nuclear energy, world peace on August 3, 2015 by Traveltorgeir. I visited Hiroshima Castle in March 2014. Today Hiroshima is once again a vibrant city. At night its streets fills with people going to a restaurant, bar or pachinko parlour. Its streets are noisy, packed with people. During the weekend it can be hard to find a table at a restaurant. There are hardly any signs of the atomic bombing left. With some exceptions, only the Memorial Peace Park and Genbaku stand as a remainder of what happened seventy years ago. This entry was posted in Hiroshima Week, history, Japan and tagged atomic bomb, hiroshima on August 2, 2015 by Traveltorgeir. I visited Hiroshima Peace Memorial Museum in march 2014. On August 6, 1945, the atomic bomb Little Boy exploded over the city of Hiroshima. The explosion killed over 70.000 people instantly. For those who survived the bomb, the future seemed uncertain and grim. Even before the atomic explosion, the common people of Japan had suffered. The military confiscated most of the rice and other foodstuff from the peasants, who were forced scavenge for whatever could be eaten to survive. This entry was posted in Hiroshima Week, history, Japan and tagged atomic bomb, hiroshima, little boy, peace memorial museum, peace memorial park, world war two on August 1, 2015 by Traveltorgeir. I visited the Genbaku (A-bomb) Dome in Hiroshima in March 2014. On August 6, 1945, an atomic bomb was used in war for the first time in history. At 8:16 in the morning, the uranium-type bomb ‘Little Boy’ exploded over the city of Hiroshima, Japan. The destruction was massive. Little Boy had its uranium divided in two, and used an explosion of gun powder to make the two parts crash into each other and reach critical mass for a nuclear chain reaction. This chain reaction in only one kilogram of uranium caused a nuclear explosion equal to 16 kilotons of TNT. This entry was posted in Hiroshima Week, history, Japan and tagged atomic bomb, enola gay, Genbaku, hiroshima, little boy, world war two on July 31, 2015 by Traveltorgeir. On August 6,1945, at 2:45 am, the plane Enola Gay and two others set out from Tinian, a small pacific island in the Marianas. Ten days earlier, the Allies had issued the Potsdam Declaration, calling for the unconditional surrender of Japan, or the country would face ‘prompt and utter destruction.’ In the hold of Enola Gay was the instrument to deliver that destruction. This entry was posted in Hiroshima Week, history, Japan and tagged atomic bomb, enola gay, hiroshima, little boy, manhattan project, nuclear, potzdam declaration, world war two on July 30, 2015 by Traveltorgeir.